Overview of the 1873, 1874 and 1876 diaries of Ida Isadore Reynolds (1860-1946) of Acton, Maine. Ida was the daughter of Jonathan Prescott Reynolds (1920-1899) and Rachel E. (Tupper) Reynolds (1833-1923), natives of Maine and Nova Scotia respectively. Ida would marry John Jotham Shapleigh in 1881. The Reynolds surname had variants of Runnels, Runnells and Runnals, as noted in A Genealogy of Runnels and Reynolds Families in America: With Records and Brief Memorials of the Earliest Ancestors, so Far as Known, by Moses Thurston Runnels, published in 1873. 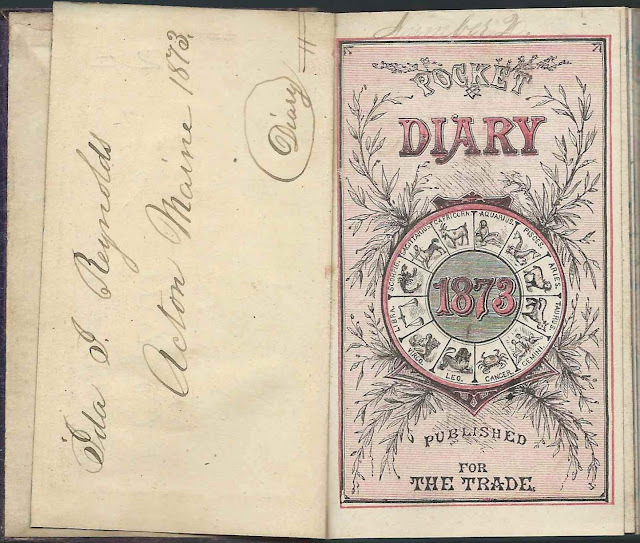 This post and future ones featuring entries from Ida's diaries, are subject to change, with credit, as new information comes in. If you have corrections to the transcriptions in any of the future posts and/or information to share on people mentioned, please leave a comment or contact me directly. 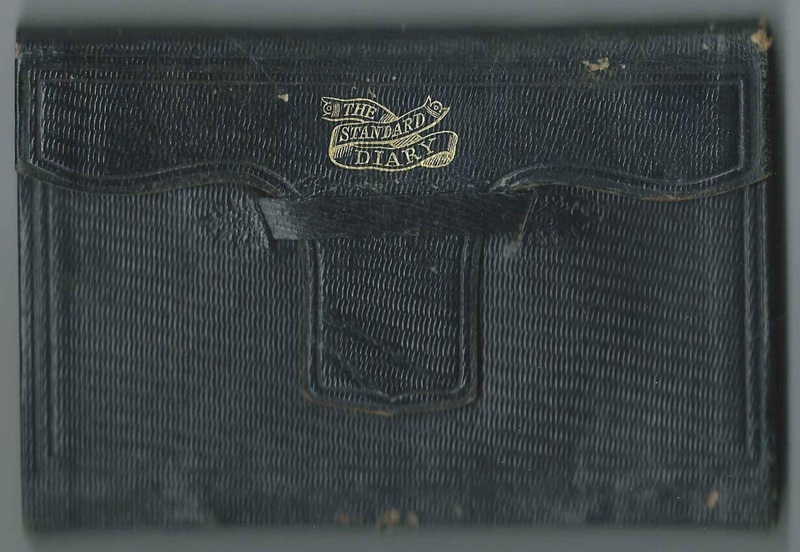 I'd also like to add Ida's other diaries, if they can be found. 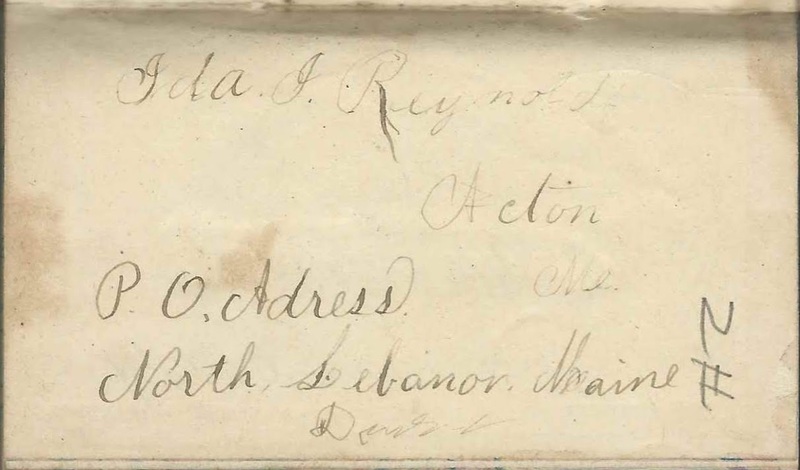 Ida was presumably named for Ida Isadore Decker (1851-1854), daughter of Nathaniel Curtis Decker (1828-1888), a native of Boothbay, Maine, and Joanna Farnham (Reynolds) Decker (1825-1909), who was a sister to Jonathan Prescott Reynolds (1820-1899). 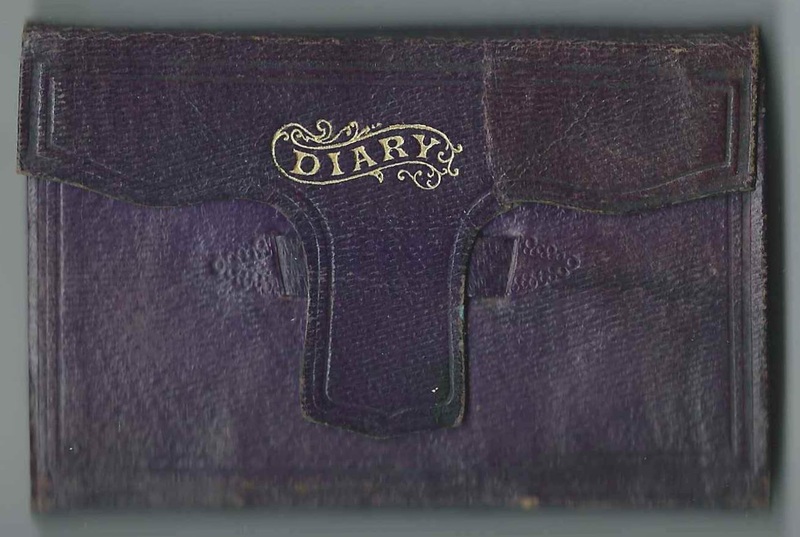 Diarist Ida lived for a time with the Deckers while she attended school in Boston; she must have been very special to them. 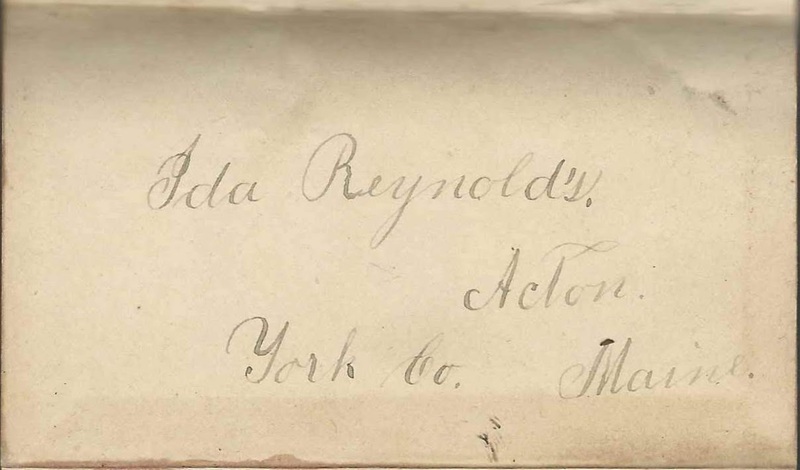 By the time of these diaries, only one of Ida's grandparents still lived, Ann (Worster or Worcester) Reynolds (1793-1884), widow of Rev. Paul Runnels (1790-1842). "Grandmother" appears many times in the diaries. She may have lived with her youngest child, Jacob Pickering Reynolds (1838-1914), as they usually came on visits together. Jacob had an older brother of the same name, who died young - Jacob Pickering Reynolds (1833-1837). 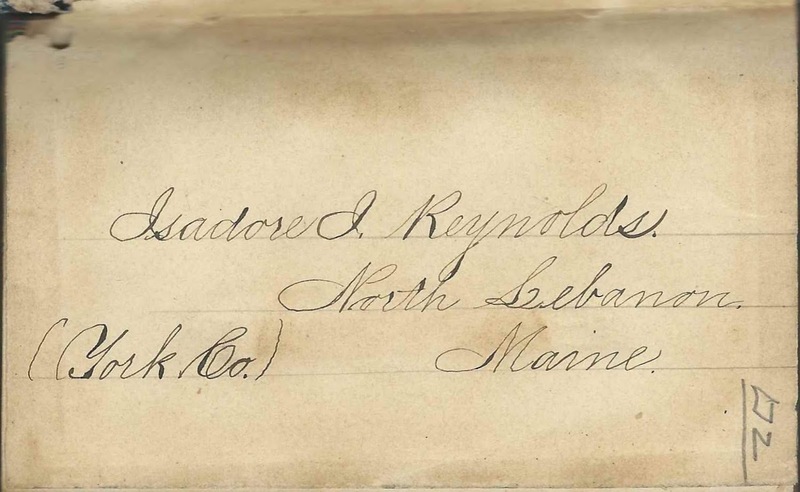 Also living in the Reynolds household at times were Ida's older brother Edward Everett Reynolds (1855-1945) and a Sam/Sammy/Samuel, who I believe was Ida's maternal cousin, Samuel Muir Francis (1858-1928), son of Dr. Daniel Francis (1810-1867) and Christie Ann (Tupper) Francis (-1893) of Nova Scotia. Samuel Muir Francis' siblings, Hannah Francis (abt 1854-1923), also known as Annie, and Edward Francis (1850-1931) stopped by from time to time. Ida kept up a correspondence with Hannah, also known as Annie, whose address appears in the 1873 diary as Hannah Francis, c/o of a real estate agency at the corner of Randall and North Main Streets in Providence, Rhode Island. Hannah/Annie Francis would marry James Alexander Buchanan (1850-1906). The Reynolds farm was located along the southern border of Acton, Maine, and may have extended into Lebanon, Maine, to the south. As you can see from the image above, the family got their mail through the North Lebanon Post Office. 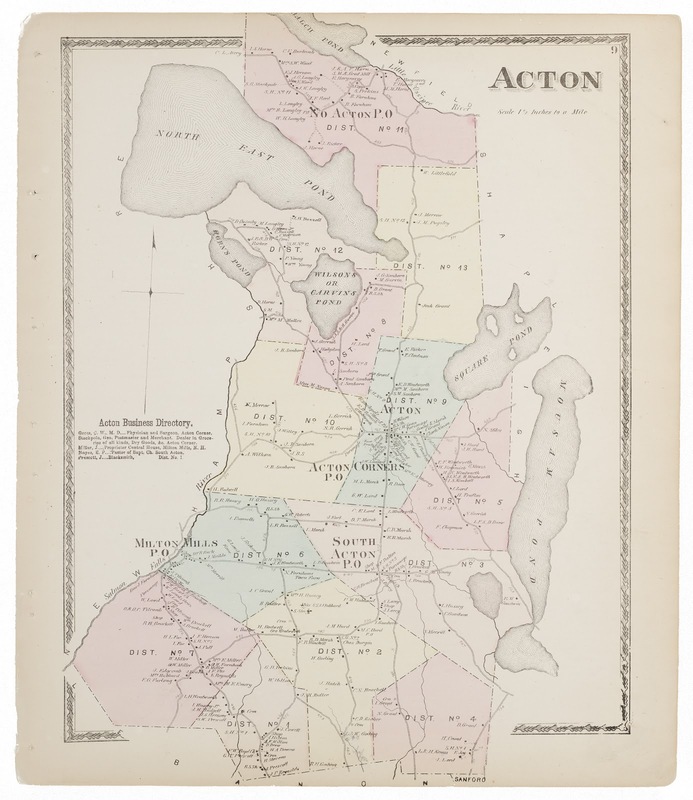 Note below the J. P. Reynolds residence along the southern border of Acton in this 1872 map of Acton, Maine, held by the Digital Maine Repository, and an enlargement of the area of the Reynolds farm. As you would expect, many of the people living near the Jonathan Prescott Reynolds residence figure prominently in the diaries. Ida mentioned every caller to her home, as well as the places she visited. In fact, the volume of visiting, by the Reynolds family and by visitors to the Reynolds home, even in winter and to and from remote farms over bad roads, is mind boggling. Many times people would drop in unannounced, be fed and invited to stay the night. Neighbors also pitched in to help one another with chores and in times of adversity. Ida's parents looked out for their elderly neighbors, such as Andrew Hilton (1810-1873) in his decline and death and, thereafter, his widow Eliza Ann (Paul) Hilton (1816-1891). Ida loved attending schools of any kind, including scholastic, "Spelling" and "Singing", but schools were not always available to her. 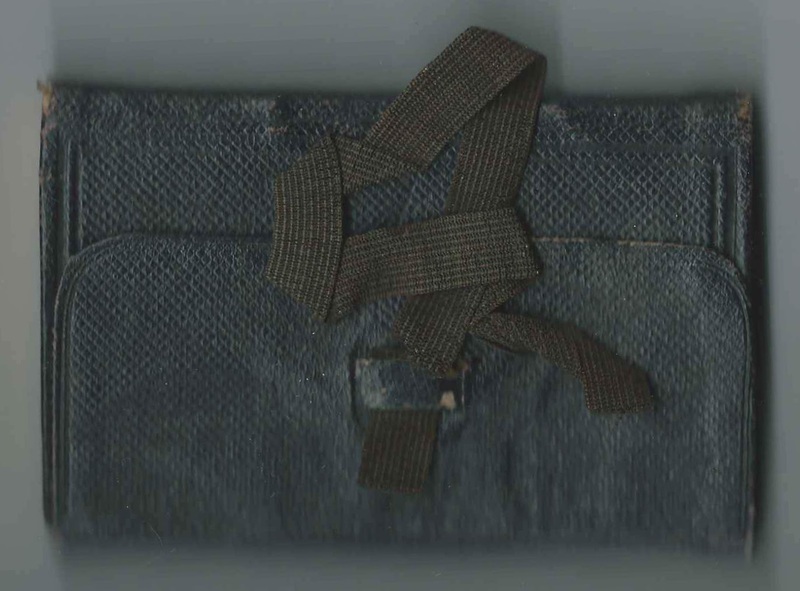 In order to find them, she sometimes boarded at adjacent Milton Mills, New Hampshire, with her maternal aunt Lucy Jane (Tupper) Sawyer (1837-1880) and husband Rev. Seth Sawyer (1808-1892) or in Boston, Massachusetts, with her Aunt and Uncle Decker, mentioned above, and their son Walter Curtis Decker (1855-1900). playing the piano and singing, at home, during extended visits to her Aunt and Uncle Sawyer at Milton Mills, New Hampshire, and at gatherings, formal and informal. Ida noted many deaths in her Maine and New Hampshire neighborhoods. In one case, I discovered that online sources record Benjamin Drew (1784-1874) of Acton, Maine, as having died on January 17, 1874; the diary makes clear that Benjamin died on June 17, 1874; a discrepancy easy to understand. Andrew Hilton (1810-1873), who was apparently on the decline for much of 1873, and his wife Eliza Ann (Paul) Hilton (1816-1891), as well as their sons John Paul Hilton (1836-1895); Charles Albert Hilton(1858-1894); and Luther Drew Hilton (1858-1894) also appear in the diary many times. Ida's friend Georgia A. Hilton (1864-1926), daughter of Andrew F. Hilton (1836-1894) and Emeline A. (Hersom) Hilton (1838-1884), "Emma"
George Lockwood Prescott (1845-1883), "Lock", son of George Washington Prescott (1815-1886) and Eliza G. (Brackett) Prescott (1817-1898 and husband of Isabelle G. (Churchill) Prescott (1845-1923), "Belle"
Ida's close friend Harriet Eldora Sherman (1859-1937), "Hattie", daughter of Thomas Sherman (1823-1893) and Abigail Elizabeth (Fox) Sherman (1822-1877), "Abbie"; Hattie would marry George Walter Chamberlain (1859-1942) in 1887. Hubbard Stevens (1805-1882) and wife Harriet C. (Brackett) Stevens (1808-1883), parents of Jacob Brackett Stevens (1850-1917), husband of Charlotte M. (Shapleigh) Stevens (1851-1917), also much mentioned. Alphabetical list of people mentioned in the three diaries - Please send notifications of corrections, clarifications or additional information.